Greater access to capital is critical to continuing the growing momentum in the Dayton startup community. Funding can’t just be for high-growth or technology-based startups – businesses of all types need to have opportunities for funding. To provide another outlet to support Dayton small businesses, in 2017 Start Downtown launched Kiva Dayton – a collaborative effort between several startup ecosystem partners to utilize the international platform of Kiva as a lending outlet for local small businesses and startups. 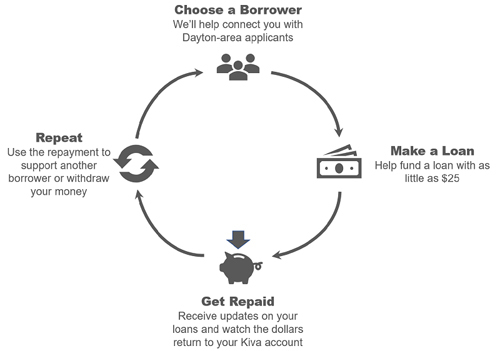 Kiva is like crowd-funding, but instead it’s crowd-lending – after your loan is repaid, you can use the same dollars to support another small business. Loans are 0% interest and are repaid by the small business over a period of 6-36 months depending on the loan size. Businesses that apply for lending through Kiva have 30 days to reach their fundraising goal. If they don’t reach their goal, they don’t receive funding. What businesses are a fit for Kiva? Kiva borrowers are typically businesses that are unable to access capital through traditional lending outlets – either because they don’t have a revenue track record, or because they are unable to meet the loan down payment requirements. Kiva isn’t easy money though – you need to have a good plan and be willing to hustle to meet your fundraising goal. For entrepreneurs just getting started, Kiva is a great option to build financial credibility. The Kiva Dayton team is building a base of ecosystem partners that can advise local startups on how to put together strong Kiva applications, and network of Dayton funders who help provide support to local small businesses. You can help by signing up to be a lender on Kiva and joining the Kiva Dayton Lending Team. To learn more about Kiva, or to explore an application for your small business, please contact Scottt Murphy at murphy@downtowndayton.org.